After visiting Derry earlier this year and seeing the murals in the Bogside, I really needed to find out more about the works and more about Northern Ireland. Created by the Bogside Artists (Thomas Kelly, William Kelly, and Kevin Hasson), these murals depict a living history. Powerful and emotive, the images resonate, however, their message transcends the Bogside and Northern Ireland, leaving a greater hope for universal peace. Firstly, Tom can you tell me about yourself? How did you first get into painting, etc? And what made you, William and Kevin start collaborating artistically? I had been working with Declan McGonagle in the community Outreach program for ten years, doing murals etc. Collaborating with my brother William who had a degree in painting from the NCAD, Dublin and my good friend Kevin Hasson was a natural development when I got the notion of turning the Bogside into an open-air gallery of murals commemorating the history of the Troubles. I find the Murals powerful, emotive and striking; can you give me a history of how and why you decided to make art on such a massive scale depicting the Troubles? We paint what we think is important. Our first mural, however, was the result of a general need on the part of the people living in the Bogside to have something with which to commemorate the 25th anniversary of the Battle of The Bogside. We did all of the murals without pay. Because we could not find public funding especially from the arts councils both North and South we had to go around the doors with a tin can collecting pennies from the citizens. You can find this in our BBC documentary but we have no copies of that left. Content and style are thrashed out between us in a spontaneous collaborative effort some people call "brain storming." We begin with knowing WHAT we want to express. The HOW comes later. Also, we invariably change features and repaint as we go along. That means the work is not still-born and has consequently some life in it. Today, Street Art has connotations associated with graffiti, but your work takes on more traditional techniques, can you give me an idea of your technique? I am glad you asked that as a great many people think we used computers and overhead projectors and such like. We didn’t. We used the same techniques used by Michelangelo by squaring up the image and tracing it out on a grid prepared with chalk and plumb-line on the wall. The wall is rendered with sealer and given a base coat of outdoor emulsion in the appropriate tone of grey for the image. The image itself is built up on stages from thin to thick in the highlights using acrylic with emulsion for the larger areas. The palette is kept simple as we are not in the decorating business but trying to convey the seriousness of the content we are depicting. It is art, first and foremost that concerns us, - to express something while keeping out egos out of it. Easier said than done. That we are able to do it at all in perfect harmony says something for us as artists whose egos are notoriously rampant and often irrational. When it comes to starting a Mural, what does the process involve? Logistically in terms of the scale, but also mentally and emotionally? How do you decide what to paint? Brainstorming. We can take days and many coffees figuring out what is appropriate but having a defined story to tell makes it easier. The key events are the substance of the story. Inspiration comes slowly and usually at the point when all hope is gone. Your murals are telling a story and pay homage to the difficult times, how do you feel that they are connecting communities and provided an outlet for peace? The murals have endowed the area and the people who live there with a sense of pride. It is their history after all that is painted. The murals also bring in many visitors into the area. Before the troubles there were so few visitors into the city that the local tourist board did not even bother to keep records! Now, there are thousands. And many of them come to see the murals per se. That brings revenue to the city, to both sides of the community and especially in the tourist and hospitality sector. Jobs and a decent standard of living foster peace, peace and hardship do not. Also, if the murals were not there you would find the walls festooned with graffiti and political slogans. It would resemble a typical warren of Glasgow or Liverpool. In brief, the murals ( in the words of ex-Mayor Gerry OHara) have been a "boon to the city as a whole". On a recent visit to Derry, I went on a tour around the city, I understand that the there were some changes to Death of Innocence from its unveiling in 1999, can you tell me more about those changes and why? Have any of the other Murals changed and why? At the time we painted the mural peace was not assured do we left the butterfly at top left unfinished for that reason. A new beginning or resurrection for the community had yet to be achieved. When it finally was, we completed the butterfly. Petrol Bomber is a powerful image and incredibly moving on many levels; can you tell me more about this piece? 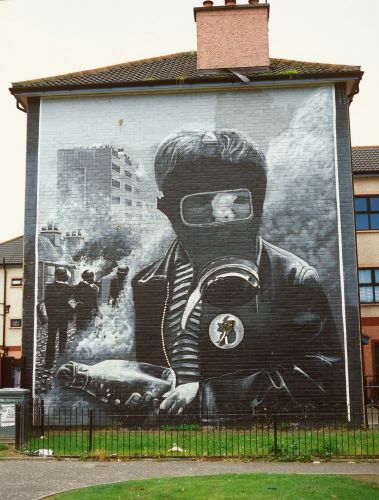 Many of your Murals were painted in the 1990s about events from the 1960s and 1970s, as a member of the Bogside community, how did it feel to illustrate these events decades later, and on such a large scale? At first, what was the reaction of the local community? You do what you have to when you are living in our situation. What was the alternative…do nothing? People in the area knew what we were trying to do and fully supported us. They understood the work and still do. Adverse criticism came only from people who did not understand them or who lumped them in with political propaganda of the sort you find in Belfast. Other adverse criticism came from the loca arty wannabes who were jealous of our achievement and still are. Unfortunately these people have connections in high places, which is why we find it such a struggle to survive as a group. Such funding as we have received over the years we have had to fight for, tooth, nail and claw. We have not since 1994 received a single offer of help or even a phone call from our incumbent Arts Officer. Can you tell me more about your “Encouragement Programme” and how it is developing / nurturing young artists in the area? What are the hopes and aspirations? We have had many exhibitions to date and will have many more showcasing young talent. Getting a start in the commercial art world is well nigh impossible for unknowns and our feeling is the sooner you get a start the better. So, we give them a leg up. We get no funding to do this and take nothing from whatever the exhibitor may earn. We enjoy helping. They have only to take care of their own publicity. It is a useful service to the community and a fingers up to the money-grabbing curators of galleries everywhere who can take up to 50% of an artist’s earnings. People are in jail for less, in our view. Do you have any plans for any future Murals, if so; can you give me some details? We have some ideas for other murals but we cannot divulge. The wannabes compete with us and if they got wind of any or our project they would be burning the midnight oil to try and upstage us. Sad but true. We, on the other hand, compete with nobody but we do like peace to be able to get on with what we do best. For visitors to Northern Ireland, Derry and the Bogside, what would you like them to take away? Hope in the innate species-goodness of the human race and the fact that suffering has meaning.